I am always trying very hard to use up the huge bunch of kale which I bought from the Farmers’ Market. How much kale can I use for just the two of us? 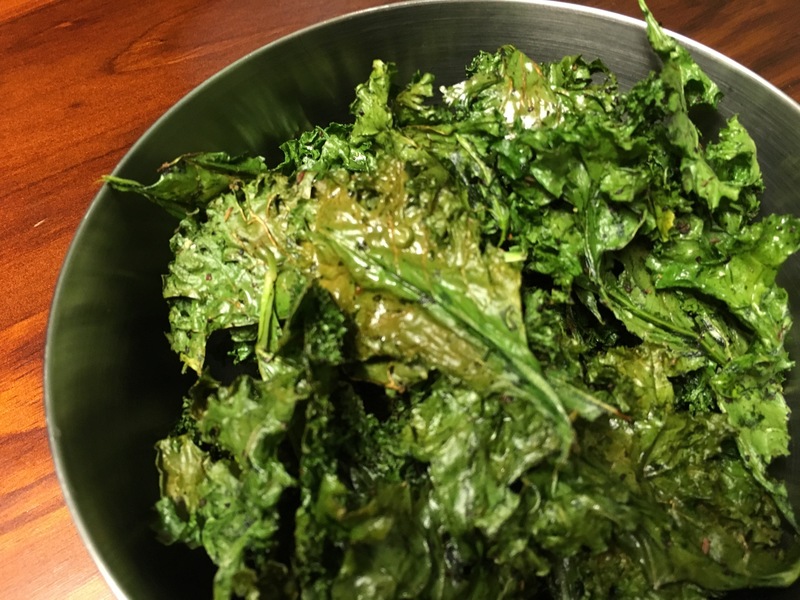 So, making kale chips seems like an option to use up the kale before they reached their “expiry” date and they served as good munchies too. Moreover, it is quite easy to make except that you have to be experiment a few times before you get nice crispy chips without having them burnt. Pre-washed the kale and dry it well. Trim out the rib and discard. Tear or cut the leaves approximately equal in size. Place the kale in a big mixing bowl. Add in the olive oil and toss the kale thoroughly ensuring all the leaves are coated. Add in the salt and black pepper. Line a baking sheet with parchment paper. Lay the kale in a single layer on the parchment paper. Bake for about 8-10 mins, just until crisp. Check often to make sure the kale is not burnt. Remove from the oven and let it cool before enjoying the healthy snack.